Probably the most audacious and clever covert military operation in medieval history was Shivaji’s night raid against the Mughul commander Shaista Khan. After Shivaji had won a few high profile battles, the Mughul Emperor Aurungzeb was determined to contain and crush the ambitious Hindu upstart. The person who Aurungzeb chose to command his massive attempt to exterminate the sapling power of Shivaji was Shaista Khan, his maternal uncle of Iranian origin, who had won honours as a general and an administrator, as well as knowing the affairs of the Deccan region where Shivaji was based. Aurungzeb was confident that the experienced Shaista Khan would teach Shivaji a lesson, regarding him as merely an adventurer. Towards the end of January 1660, Shaista Khan proceeded from the city of Aurungabad to crush Shivaji’s dominions. He led an army of 100,000 with 5000 artillery wagons and many beasts of war. This was a challenge to the existence of the Marathas greater than they had faced previously. However the trademark guerilla warfare of Shivaji did not make things easy for the huge Moghul army, who were drawn into a long and costly struggle. They needed substantial reinforcements in order to gradually gain the upper hand over a period of 3 years. Aurungzeb had underestimated the resolve of Shivaji’s Marathas, the strength of spirit of soldiers under inspirational leadership, who believed they were representatives of a man of destiny. Shaista Khan was realising this and was having second thoughts, realising that the campaign could not be completed without an enormous expenditure of time, men and resources. He expressed to Aurungzeb his willingness to accept the peace offers being made by Shivaji. But Aurungzeb would not hear of deals of any kind. The Mughals had begun to get the upper hand over the period of 3 years in which their army had been in Deccan, but there entire gains were to disappear virtually overnight. Shaista Khan had set up residence in Lal Mahal, which was previously a palace of Shivaji. This was a fatal error. Shivaji knew the palace inside out. It is said that Shaista sent emissaries to challenge Shivaji to come down and confront him. He said – “You hide away I the hills like a monkey.” In return, Shivaji asserted that he was not only a monkey but Hanuman himself, just as Hanuman made a fool out of the demon Ravana, he would do the same to Shaista Khan. Khan never realised the dangers of dealing with Shivaji in such an insolent manner, and the disaster which would befall his career. In spite of all his arrangements that no Hindu soldier or civilian should leave or enter Pune without applying for permission, his precautions failed by a shrewd plot of Shivaji.. One of Shivaji’s spies in the army camp of Shaista Khan successfully applied for a pass for a wedding procession to enter the town. When the wedding procession entered the town, Shivaji, together with 200 handpicked Mavali* warriors smuggled themselves into the town by the procession. Shivaji had also placed soldiers outside of the town, and many men hidden in the wilderness with trumpets, horns and torches (as signal bearers), to cover all eventualities of outcome in his perilous enterprise. Previously Shaista Khan had taunted and gloated at Shivaji that he was living in a house especially made for Shivaji, called the Lal Mahal, made under the instructions of Dadaji Kondev, Shivaji’s old guardian and mentor. This enraged Shivaji, but it also meant that Shivaji knew every nook and cranny of the abode and surroundings. Shivaji entered the Lal Mahal silently and in disguise, with 25 select troops. They escaped notice of the guards, and crept into the kitchen, quickly and quietly slaying the cooks. They began to as quietly as possible dig a hole into Shaista Khan’s bedroom. The noise of the pickaxes awoke the maid-servants, who awakened Shaista. In the meantime, Shivaji entered the inner apartment through the hole, followed by his men and swiftly attacked Shaista Khan who rushed to the window to escape. Shivaji struck at him with his sword as he was escaping and cut off a finger, but he escaped by a whisker. Shaista Khan’s son, Abdul Fatih Khan and many of the guards in the house were done to death. Shivaji realising his enemy was now fully aroused, hastened to his exit, and together with his stationed reinforcements left the town. When they had gone 3 or 4 miles, some Marathas waved their torches flauntingly at the Mughals. Its aim was to add insult to injury, but also to diverge attention from Shivaji, who was returning by a different route, to Sinhagad (the “Lion’s Fort”). This out of all Shivaji’s illustrious career is remembered widely as the most daring and courageous. The planning, execution and daring, to enter what was pretty much an army camp, could teach most modern commandos a thing or two. 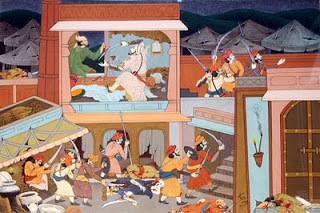 To add to the victory, the next day, a body of Mughals came rushing towards Sinhagad for revenge. They were permitted to come very close to the fort without opposition, and were thus lulled into a false sense of security. They began to beat their drums and brandish their swords. Then all of a sudden many guns fired upon them and they retreated in utter confusion, and in their retreat a party of Shivaji’s horse men fell upon them and completed their flight and disgrace. Amongst the Mughals, Shivaji was taken to be an incarnation of Satan. No place was believed to be fool proof against his entering. Shivaji became the talk of even the common people, throughout the whole of India.